Publication details: Book. 2006. xiv and 98 pages. Publication date: 2006-10-24. with 59 figures of which 3 in color, 1 table. Hardbound. 16x24 cm (6.3x9.4 in). This is the third Consensus Book published under the auspices of AIGS. As with prior consensus reports, this one has great potential to impact patients, both individually and collectively. Reports for this consensus were prepared and discussed using the same internet based e-Room system as used with the previous two reports. The Consensus Faculty consisted of the leading authorities in Angle Closure, with representatives from six continents. These 110 experts dedicated their knowledge, time, and insight to the preparation of the reports between January 1 and May 1, 2006. Prior to the meeting, each of the AIGS member Glaucoma Societies was sent a draft of the consensus report for comment. Each member Society also was invited to send a representative to attend the consensus meeting. The report then was discussed extensively during the Consensus Meeting that was held in Hollywood, Florida on May 3, 2006. Reports and Consensus Statements were revised following these discussions. Consensus is based on the published literature and expert experience. While one strives to practice evidence-based medicine, many aspects in ophthalmologic practice have not been subject, or are not amenable, to long-term prospective randomized controlled trials. Though expert consensus is not a surrogate for rigorous scientific investigation, it does have value, in particular, where the appropriate evidence is lacking. Generating consensus inexpert opinion for Angle Closure therefore aims to derive the most appropriate management for our patients and will highlight areas where further research is required. than leaving them in the hands of one or two people, no matter how smart those people are." This is the third glaucoma consensus held under the auspices of the AIGS. It is anticipated that the discussions and conclusions from this consensus will impact care of patients with Angle Closure and Angle Closure Glaucoma significantly. As with the previous consensus meetings on Glaucoma Diagnosis and Open Angle Glaucoma Surgery, the consensus reports were developed over several months in an interactive internet system. The Consensus faculty, consisting of leading authorities on Angle Closure from throughout the world, met in Fort Lauderdale on May 3, 2006 to discuss the reports and refine the consensus points. Primary Angle-Closure Glaucoma is a leading cause of blindness throughout Asia, and may be more common in European-derived populations than previously recognized. Even though Open-Angle Glaucoma is more common than primary Angle Closure Glaucoma, it has been estimated that nearly half of all glaucoma blindness is due to Angle Closure Glaucoma because it tends to be more severe. Further, an aging population should increase the number of individuals affected by Angle Closure Glaucoma. Clearly, strategies need to be articulated to face this challenge. There has been an explosion of research on Angle Closure and Angle Closure Glaucoma during the past two decades. Ultrasound biomicroscopy provided information about the angle that had been hidden from an observer using only a conventional slit lamp. This had lead to changes in our understanding about the mechanisms of disease as well as our approaches to disease management. Even the basic terminology used to discuss Angle Closure and Angle Closure Glaucoma has changed. Newer instruments, such as anterior segment OCT, now offer the promise of even more detailed assessment of the anterior chamber angle. Nevertheless, our current management of patients with Angle Closure Glaucoma remains similar to what it was decades ago, starting with iridotomy and performing additional surgeries as needed. 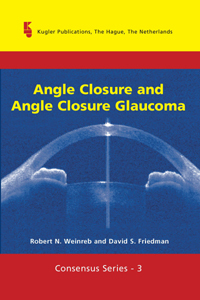 Trying to determine best practices for Angle Closure and Angle Closure Glaucoma with the rapidly growing literature on the topic is daunting. As with the previous two AIGS consensuses, the Angle Closure Consensus is based on the published literature and expert experience. Although consensus does not replace and is not a surrogate for scientific investigation, it does provide considerable value, in particular, when the desired evidence is lacking. The goal of this consensus was to establish what we 'know' and what we need to 'know' to better elucidate the mechanisms, and optimal screening and treatment strategies for angle closure. It is expected that this consensus report will serve as a benchmark for our current understanding, and that it will be revised and improved with the emergence of new evidence.